Imagine an American Library Association (ALA) Annual Conference where you meet in one large room from 9:30 a.m. to only half past noon for six days, after which you are free to go wandering around an exhibit and amusement area 13 times the size of Disney’s Magic Kingdom in Florida. 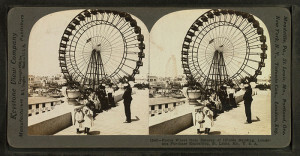 Stereoscopic card showing the Ferris Wheel at the 1904 World’s Fair, St. Louis. Imagine a conference where, after listening to a “characteristic address” by Melvil Dewey—“full of the enthusiasm of invention and the ardor of prophecy, which never fails to kindle a responsive spark in his audience”—you venture out to ride on the biggest Ferris Wheel in the world, eat some new-fangled ice cream cones, watch Alexander Graham Bell participate in a kite-flying contest, listen to rousing performances by John Philip Sousa’s band, or thrill to reenactments of Spanish-American War naval battles and the Boer War Battle of Colenso. 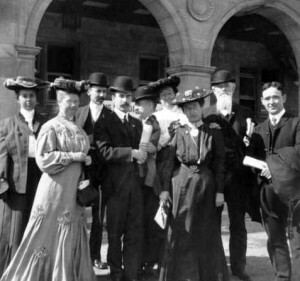 1904 Annual Conference attendees (in unknown order): Mary Letitia Jones (Los Angeles Public Library), Charles Wesley Smith (Seattle Public Library), Walter M. Smith (University of Wisconsin, Madison), Frank Barna Bigelow (New York Society Library), Frank Pierce Hill (Brooklyn Public Library), Isabel Ely Lord (Pratt Institute Free Library), Helen Elizabeth Haines (managing editor, Library Journal), Aksel Andersson (Uppsala University, Sweden). 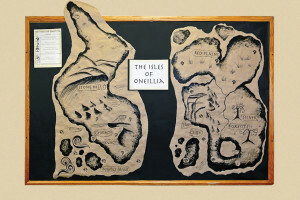 Photo: ALA Archives. October 17–22, 1904, was “American Library Association Week” at the St. Louis World’s Fair, formally known as the Louisiana Purchase Exposition in commemoration of President Thomas Jefferson’s acquisition of the Louisiana Territory from France in 1803. Like many other organizations, ALA saw the fair as a wonderful opportunity to hold its annual meeting in a historic venue that offered unlimited educational benefits. The Inside Inn, where ALA attendees stayed. In the morning, conference-goers hopped on the Intramural Railway for 20 minutes to get to their meeting room in the Hall of Congresses, a large building with 40 auditoriums. 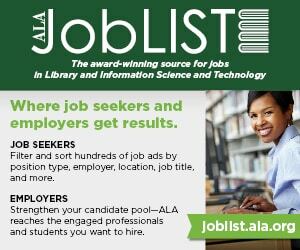 The room was described as “pleasant and satisfactory, well ventilated, and with good acoustics” and ALA claimed that fair officials said no other convention “had been attended so largely and continuously” as the ALA sessions. The only mix-up occurred when deaf and blind writer and activist Helen Keller was assigned the ALA room by mistake for her speech, and attendees had to push through an overflow crowd to meet in a smaller room down the corridor. Washington University’s Ridgley Hall, site of the World’s Fair Hall of Congresses, where ALA sessions were held. Amazingly, you can still visit the very spot where ALA met and Helen Keller spoke. Washington University was about to move from downtown St. Louis to a site at the edge of the city when fair organizers asked about renting the newly constructed buildings in 1903 and 1904 as headquarters for the exposition. The university agreed and postponed its move until after the fair. 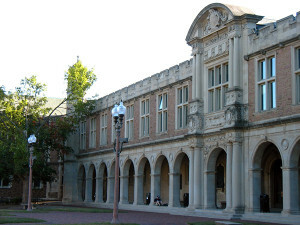 One of the new buildings was the Hall of Congresses, which became the university’s Stephen Ridgley Hall in January 1905 and housed (appropriately) the main library until the 1960s. Ridgley Hall still stands and is the home of the departments of Germanic and Romance languages and literatures. The ALA meeting room was transformed first into Ridgley Library’s reading room, then into a lounge area, and now it persists as the Holmes Lounge, a venue for jazz performances and other special events. An article titled “Seven Days at the St. Louis Fair: The Lighter Side of the Conference” appeared in Library Journal as part of the conference proceedings. 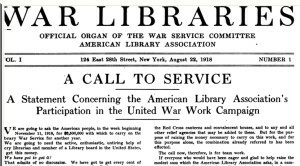 Written by “One at Headquarters”—an ironic designation, since ALA at the time was without a central office, with correspondence handled by ALA Secretary James Ingersoll Wyer in Nebraska, the ALA Publishing Board in Boston, and Library Journal editors in New York—the piece was probably penned by none other than LJ editor and founder Richard Rogers Bowker. 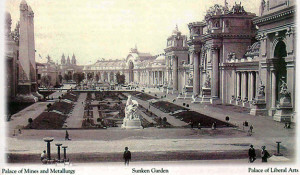 A view of the magnificent Sunken Gardens similar to that experienced by R. R. Bowker. The Tyrolean Alps concession consisted of 21 buildings and gigantic, three-dimensional, painted mountains made of reinforced plaster of Paris. Tony Faust of St. Louis and August Luchow of New York ran a 2,500-seat restaurant that ALA attendees adopted as their after-hours headquarters. 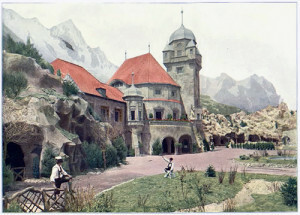 He also reveals that the magnificent Tyrolean Alps Restaurant became the after-hours “recognized headquarters of the Association,” set in an authentic Alpine village (complete with specially constructed fake mountains) where diners could drink beer or lemonade and listen to the melodies of “Kounzak’s magnificent orchestra.” In fact, Bowker admits to having so much fun there that he forgot he had been entrusted with tickets to an October 19 “moonlight launch trip on the lagoons during a special illumination of buildings and grounds,” which made the fair “gleam with a many-colored radiance that made the sky look like black velvet and the moon seem insignificant.” He sheepishly turned up late for the event. 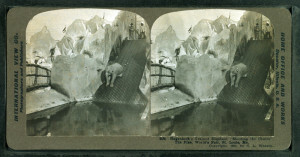 Trained elephant “shooting the chutes” at Hagenbeck’s Animal Circus and Zoological Paradise, 1904 World’s Fair, St. Louis. 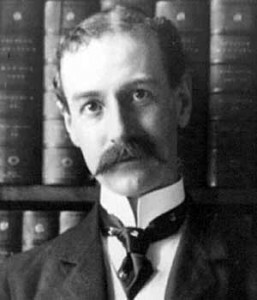 Librarian of Congress Herbert Putnam was ALA President at the time. The Missouri Building, where the ALA Model Library was housed. The building burned down on November 19, 1904. I would be remiss if I didn’t mention ALA’s own exhibit at the St. Louis World’s Fair, which actually won an award. The ALA Model Library, installed in the Missouri Building, was conducted as a branch of the St. Louis Public Library and consisted of a collection of 5,000 volumes selected by ALA as essential, some 1,500 works by Missouri authors, and several thousand books, newspapers, and magazines from St. Louis Public Library. The books could circulate to exposition employees. Melvil Dewey’s Library Bureau supplied bookshelves, counters, desks, and tables, and the Library of Congress furnished cards for the catalog. The fair awarded ALA a “grand prize” for the Model Library and gave a gold medal to St. Louis Public Library Director Frederick Crunden for his services at the exhibit. 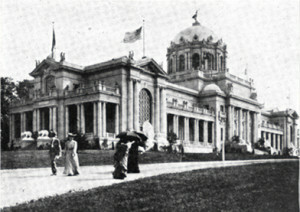 The Library of Congress also had an exhibit at the United States Government Building, featuring a sectional model of the library, a set of catalog cards showing the evolution from handwritten to printed cards, pages from President James Monroe’s journals, and a collection of Civil War music. 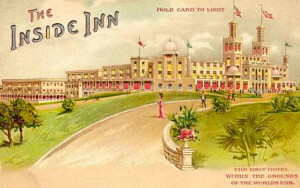 San Francisco, June 18–24, 1939, for the Golden Gate International Exposition. But the St. Louis World’s Fair represented the first blossoming of 20th-century technology that emerged from the Victorian Era. The average American in 1904 rarely traveled 20 miles from home. Few living outside the major cities had any knowledge of the wider world or developing technologies. For many, it was their first chance to see airships, wireless telegraphy, baby incubators, massive displays of electrical lighting, or foreigners of any type. It was a perfect venue for an ALA conference. 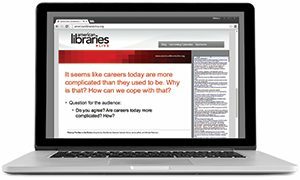 GEORGE M. EBERHART is senior editor for American Libraries. Need ideas for your Día program on April 30? Download some free booklists, planning tools, activity sheets, and web badges. Also, a Día press kit is available to help you share your Día celebration with your community and local media outlets. El día de los niños / El día de los libros (Children’s Day/Book Day), commonly known as Día, is a nationally recognized initiative that emphasizes the importance of literacy for all children from all backgrounds. We often forget that intellectual property rights are not ends in themselves, but instruments at the service of development, creativity, innovation, and welfare. Today, for World Intellectual Property Day 2019, IFLA presents this side of intellectual property, and how it has an impact on libraries. It is not the case that more rights mean better outcomes. Scholars have underlined on several occasions how more flexibility contributes to development, rather than stronger protection. Exceptions and limitations are key for many public interest activities. Copyright needs to be mindful of its impact on cultural heritage, research, and education. Trustees of the Allen County Public Library in Fort Wayne, Indiana, on April 25 deferred a vote on changes to the library’s collection development policy. The policy will likely be voted upon at the board’s May meeting. Questions on weeding raised by residents at a public hearing in March are expected to be answered by the end of April. “The board wants to make sure that they give adequate time and attention to issues they need to think about before they vote,” Library Director Greta Southard said. The goal of the revised collection development policy is “to continue with the spirit of the policy as it’s always existed,” but seeks to clarify the language. Police investigators say Boyd N. Klingensmith was denied computer access at the Greensburg Hempfield (Pa.) Area Library on April 18 because of an outstanding library fine at the affiliated Penn Area Library in Harrison City. This didn’t sit well with Klingensmith, who, according to court records, said, “I hate Penn Library. I’ll have to shoot them. If I go and shoot them, will that take care of the fine?” Library staff let him use a computer, but police later showed up. Klingensmith said he had been joking, but police found an unregistered pistol in his car. Klingensmith is being held on a $10,000 bond and was charged with terroristic threats and weapons counts. The ACRL Rare Books and Manuscripts Section has selected six winners, three honorable mentions, and a notable citation for the 2019 Katharine Kyes Leab and Daniel J. Leab American Book Prices Current Exhibition Awards. The awards recognize in five categories outstanding printed exhibition catalogs, guides, and electronic exhibitions produced by North American and Caribbean institutions. The winning catalogs will be on display at the 2019 RBMS Conference Booksellers’ Showcase in Baltimore.